How Many Devices Can One Wireless Router Handle? Computers and other devices on a network must share a finite capacity of resources, and that's true for wired and wireless (​Wi-Fi) networks alike. However, the precise limits depend on multiple factors. For example, you may notice that when you connect your laptop, a couple of PCs, and some smartphones to your network, it's much harder to stream Netflix or Hulu on your TV. Perhaps the movie stalls or looks fuzzy or you start receiving connection errors. Your router doesn't think in terms of priorities. Instead, it thinks in terms of where capacity is needed and where it's being used the most. It will pull indiscriminately in an attempt to keep all devices working at some level. Most home networks and public Wi-Fi hotspots function with a single wireless access point (a broadband router in the case of home networking). Conversely, larger business computer networks install multiple access points to expand the wireless network's coverage to a much larger physical area. Each access point has limits for the number of connections and amount of network load it can handle, but by integrating multiple of them into a larger network, the overall scale can be increased. Many individual wireless routers and other access points can support up to approximately 250 connected devices. From a wired perspective, routers can accommodate a small number (usually between one and four) of wired Ethernet clients with the rest connected over wireless. The speed rating of access points represents the maximum theoretical network bandwidth they can support. A Wi-Fi router rated at 300 Mbps with 100 devices connected, for example, can only offer on average 3 Mbps to each of them (300/100=3). If you're not sure what your router can support, Google the model number and you should be able to find it that way. Remember, however, most people only use their network connection occasionally, and a router shifts its available bandwidth to the devices that need it. Those shifts will depend upon what a particular device needs at a particular time. On home networks, all devices normally share a single internet connection. The performance will start to degrade as more devices join the network and start using it simultaneously. Even just a handful of active devices streaming video or downloading files can quickly max out a shared internet link. Access points overheat and stop working when operating at extreme loads for extended periods, even if handling only local traffic and not accessing the internet. Having a large number of Wi-Fi devices concentrated in close physical proximity, like a home or office building, generates significant wireless signal interference. Radio interference among Wi-Fi devices degrades network performance (due to frequent re-broadcasting of messages that fail to reach their destination) and eventually causes connection drops. Some home routers include a feature that allows administrators to control the number of clients that can simultaneously connect. Many Linksys routers, for example, set a default maximum of 50 maximum devices. Administrators often keep limits in place to keep the routers and networks running reliably. Installing a second router or access point on a home network can greatly help distribute the network load. By adding more access points to the network, effectively any number of devices can be supported. However, this will make the network progressively more difficult to manage. 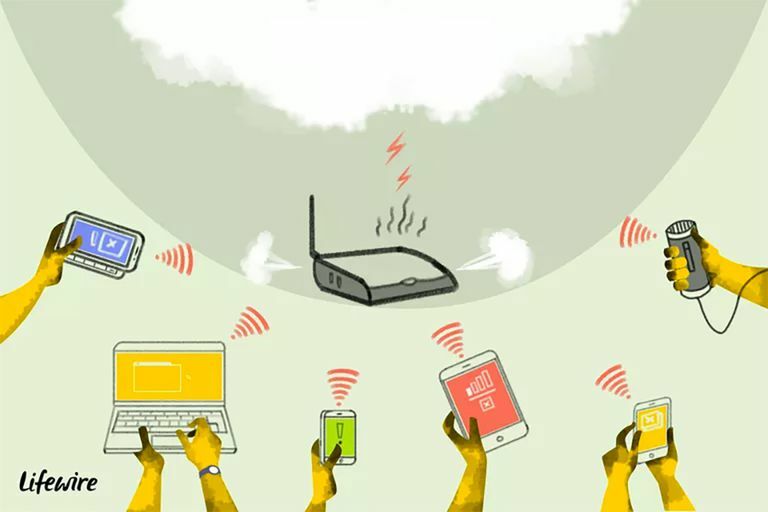 Something else you can do if you already have one or more routers that support a large number of devices is to increase the bandwidth available to each simultaneously connected device by upping your subscription with your ISP. For example, if your network devices and internet subscription lets you download at 1 Gbps, then having even 50 devices connected at once lets each device consume up to 20 megabits of data per second. Some people use mesh networks to improve wireless network coverage in their homes. These kinds of networks provide better coverage because they consist of interlocked routers that supply internet coverage over a broad area, which most traditional, single router networks just can't offer.